Recent headlines have cast suspicion on social network analysis, which can mine data from the internet to target advertisements or potentially influence elections. But what if we could use those same tools not for the economic or political gain of a few, but for the health of all humankind? Scientists now can harness the tools of social network analysis to understand connections among genes, an advance that someday could lead to medical advancements. Megha Padi, PhD, director of the UA Cancer Center Bioinformatics Shared Resource and an assistant professor of molecular and cellular biology, developed a computer algorithm called ALPACA that reveals which gene networks are activated in a diseased cell—an approach that could lead to better treatments for various diseases. The results were published online April 19 in the open-access Nature Partner journal Systems Biology and Applications. Cancer researchers usually focus on specific genes when comparing healthy cells to tumor cells, an approach that does not completely explain what occurs behind the scenes to cause cancer. "You can get a list of the parts in your car, but you won't understand what makes the car run until you understand how all the parts are connected to each other," Dr. Padi said. 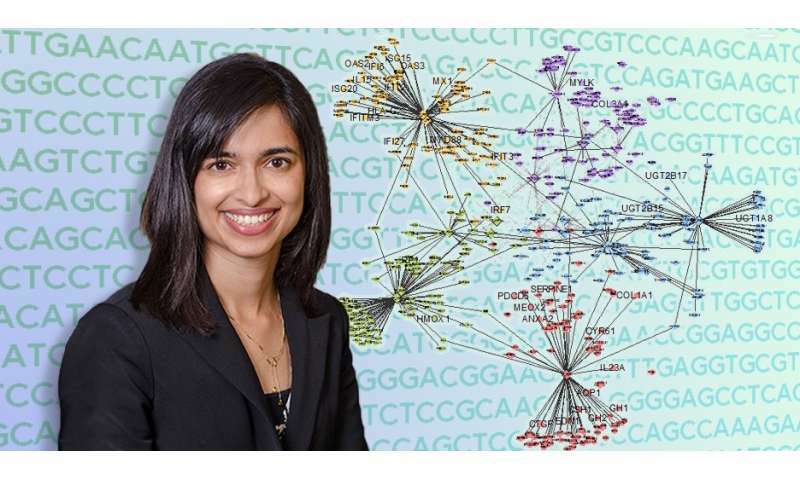 Likewise, it is essential to study how genes work together as part of a larger network, so Dr. Padi is analyzing these gene communities in the same way one would examine a social network composed of connections among people who know one another. Dr. Padi is the first author on the study, in collaboration with John Quackenbush, PhD, director of the Center for Cancer Computational Biology at Dana-Farber Cancer Institute. The study was conducted when she was a postdoctoral fellow at Dana-Farber; Dr. Padi joined the UA in January 2018. Genes in a community, like people in a social network, talk to one another. In a healthy cell, gene communities function like factory workers, cooperating to process raw materials into goods the cell needs to thrive. In a diseased cell, miscommunication along the "assembly line" results in defective products. Tracking how genes' conversations change over time might provide clues how cancer arises. These conversations can be analyzed using tools developed to study social networks. "A classic example is a phone network," said Dr. Padi. "I'm calling my mom, my mom may be calling my sister, my sister's calling me, and I may call you, but you won't call my mom. Natural communities are formed, like your work community and family community." Dr. Quackenbush added, "In the same way, we see that gene regulatory networks form communities. The pattern of 'conversations' within the communities change between healthy and diseased individuals. ALPACA is the first method to understand how the cell's 'social network' is reorganized in disease, which might provide clues how cancer forms." To uncover cancer's causes, the challenge is to find the differences between gene communities in healthy cells compared to diseased cells, rather than the differences between individual genes. But comparing gene communities is easier said than done, as the genetics underlying cancer can have tens of thousands of interacting components to sort through. Drawing a diagram of these interactions results in what researchers call a "hairball." "To make a map that humans can understand, scientists need computers to figure out the subtle ways in which this 'hairball' goes awry in tumor cells," Dr. Padi said. "We'd like to use what we have learned to develop new strategies that can help prevent or cure disease," said Dr. Quackenbush. Dr. Padi is particularly interested in using ALPACA to find novel treatments for people whose cancers fail to respond to currently available treatments. By contrasting cancers that cannot be treated with drugs, known as chemoresistant tumors, with chemosensitive tumors, those that can be treated with drugs, researchers may be able to zero in on a community of "bad guys"—genetic pathways that might be targeted with customized drugs. ALPACA's incorporation of social network analysis is an innovative use of tools most commonly associated with marketing, not medical research. "Network scientists usually ask questions like how information is being spread through Twitter or other communication channels," Dr. Padi said. "We're asking completely different questions, like how networks function in different types of tumors. This type of research is rare because not many people work on both those fields at the same time."